Ankle boots are one of the most versatile shoes. They go with everything and can help make any outfit look polished and pulled together. When I find a pair of ankle boots that I really love, I inevitably end up wearing them everyday. Last year I wore a pair of vintage black boots until the sole was worn through, which means that a replacement is in order. Below are a few of my favorite options for ankle-skimming brown boots, one of which might just become your everyday pair. 1.) If you want to be cozy: If you think that Uggs are hideous but love the comfort factor, then give F-Troupe's Sheep Skin Brown Booties on the Creatures of Comfort website a try. They mold to your foot and are lined with sheep skin to keep your feet warm. They are as comfortable as slippers but still look chic, plus F-Troupe has the most whimsically designed website that you must check out. These boots are priced affordably at $182. 2.) If you want to be rugged: Duccio Del Duca's Ankle Boots on yoox.com have a western cowboy boot shape, but the delicate proportions of the boot have a leg-elongating effect that's very feminine. 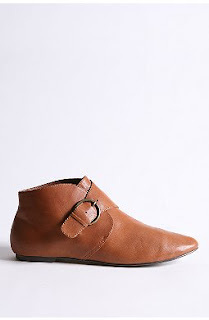 Simple and hip, these boots are perfect if you want something for casual everyday wear. These boots are a bit of an investment at $334. 3.) If you want to be hip: Made by Elves' Leather Lennon Skimmer (pictured here) is the epitome of the perfect low leather boot that all the fashion editors are sporting this fall. Versatile and chic, the Lennon Skimmer would look amazing with wool tights or skinny leather pants. These boots are a steal at only $98. I just bought the F-Troupe boots after reading this!! I'll let you know how they are. They look PERFECT for my upcoming freezing boston winter.